Stop the haunting of Nedhelas' house in Caldera. Talk to Kaye at the Imperial Chapels for a new shrine sergeant mission. Travel to Caldera to help Nedhelas. Talk to Nedhelas to learn about his ghost problems. Enter his cellar and kill the Ghost of Galos Heleran. Return to Kaye to complete the quest. 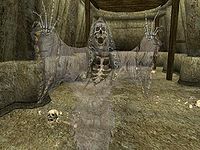 Kaye at the Imperial Chapels in Ebonheart will ask you to help a Bosmer named Nedhelas, who is having problems with a ghost in his house in Caldera. First off, ensure you have a Daedric, silver, or enchanted weapon (of any sort, the enchantment can even be completely used up and it'll still work), as these are the only weapons that can damage the poltergeist. Once in Caldera, you should find Nedhelas wandering around on the street outside his house. He'll tell you that he thinks the ghost is in his cellar and gives you a key to his house. If you note the name of the cellar entrance, the problem should be obvious... the house was built on top of the Heleran Ancestral Tomb. Once inside the tomb, kill the skeleton and the Ghost of Galos Heleran to stop the haunting. You can loot the chest if you wish. Go back to Nedhelas and report your success. Return to Kaye to receive two Scrolls of Golnara's Eye-Maze. Refusing the quest, or returning to Kaye and admitting failure causes his disposition to drop by ten. Each time you talk to other residents of Caldera after completing the quest causes their disposition to increase by 10, as long as it was originally below 70. Nedhelas never takes his key back from you. 1 A Bosmer named Nedhelas in Caldera says his house is haunted by a ghost. Kaye said ghosts aren't affected by normal weapons, so he gave me 200 gold to buy an enchanted weapon or spell, and for other expenses. I'm to talk to Nedhelas first, and I should report back to Kaye if I rid the haunted house of its ghost. 5 I told Kaye I would not be able to get rid of the ghost haunting Nedhelas' house. Kaye was disappointed, and told me not to come back for at least a day. He told me to get my priorities straight before I ask him again for a shrine sergeant mission. 10 When I asked in Caldera for Nedhelas, I was told his house is just to the right of the south gate, and that I should look for him there. 12 I spoke to Nedhelas. He said the ghost in his haunted house has something to do with a trap door. His landlord told him not to fool with the trap door, but didn't explain why. Nedhelas gave me a key to the trap door, and asked me to let him know when the ghost was gone. 15 I told Nedhelas that I had taken care of the ghost beneath his house. He thanked me, and the Imperial cult. 50 Finishes quest I reported taking care of the haunted house for Nedhelas. Kaye seemed pleased. He gave me some magic scrolls and told me to speak to him again when I was ready for another shrine sergeant mission. 1 Finishes quest I told Kaye I would not be able to get rid of the ghost haunting Nedhelas' house. Kaye was disappointed, and told me not to come back for at least a day. He told me to get my priorities straight before I ask him again for a shrine sergeant mission.